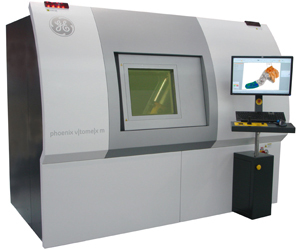 Within the phoenix v|tome|x m, GE’s unique 300 kV microfocus X-ray tube is for the first time available in a compact CT system for industrial process control as well as for scientific research applications. Beyond down to < 1 μm detail detectability, the system offers industry leading magnification at 300 kV. GE’s high dynamic DXR digital detector array and the click & measure|CT automatization functionality make it an efficient 3D tool for industrial inspection and scientific research. Due to its dual|tube configuration, detailed 3D information for an extremely wide sample range is provided: from high resolution nanoCT® of low absorbing samples up to high power μCT applications such as turbine blade inspection.